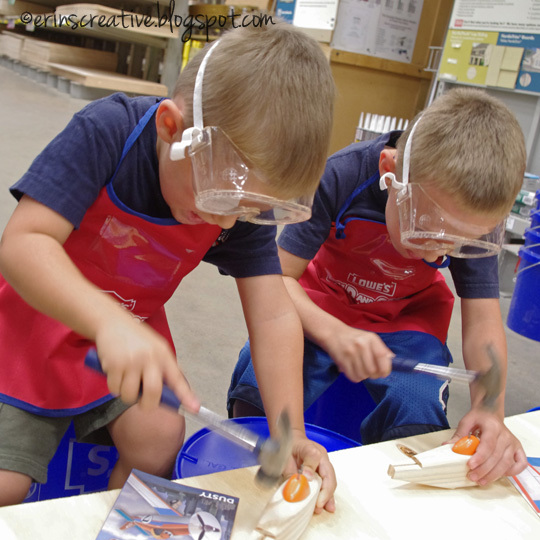 I finally got to sign the kids up for a Lowe's Build and Grow clinic! In my area, they are one hot ticket and I never get in. I have a friend to thank for giving me the heads up, Thanks Laura! 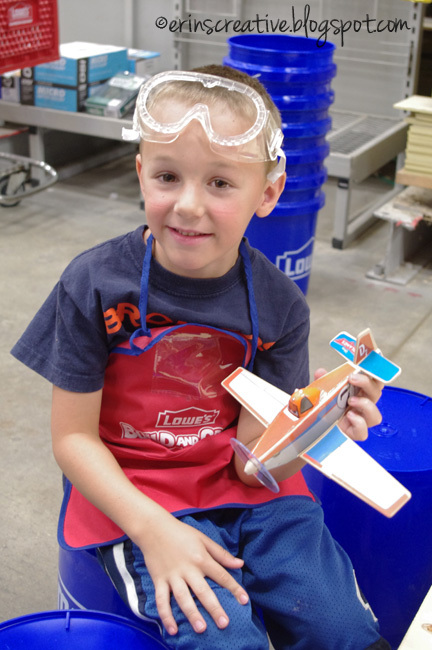 I was pretty excited for the kids as I know they will love the movie Planes and this week they got to build Dusty. Both my kids went through a massive Cars obsession, I am pretty sure it will turn into a Planes obsession soon. We haven't gone to see the movie yet, but am looking forward to taking them with my husband. This build was a little more than what my kids could do on their own, but I am knowledgeable enough to help them. The directions were in picture format, so I had Maben "read" them off. Most of the nails I started off for the kids and they tried to finish them. I had to keep reminding Maben to change his hands so he wouldn't whack a thumb. He whacked his thumb and looked surprised. Best lesson for him, he was much more careful after that and he didn't hit himself very hard. 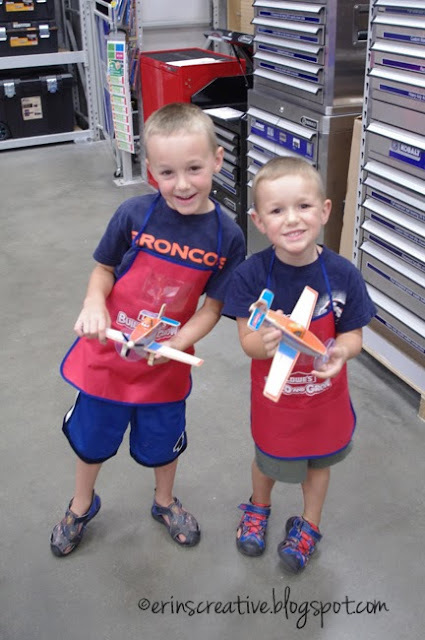 The build took about half an hour for myself to help both kids finish their plane. I think applying all the stickers correctly took longer than the build itself. The boys are very excited for their new Dusty plane and we are signed up to do El Chupacabra in two weeks! I am sure there will be lots of flying races around the house over the next few weeks. They have already started. 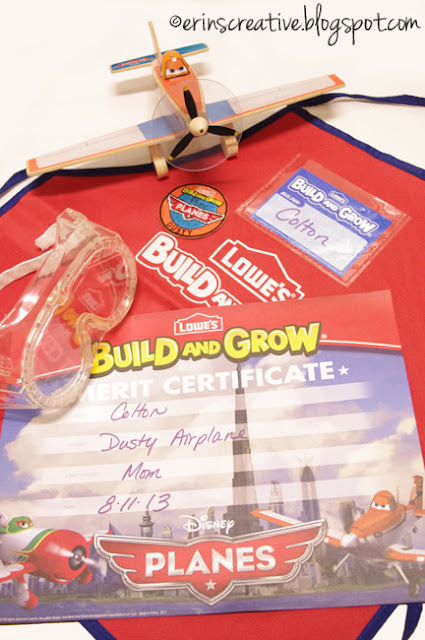 Aside from Dusty, my boys also got to come home with an apron, safety goggles, a completion certificate and a patch they can add to their apron. 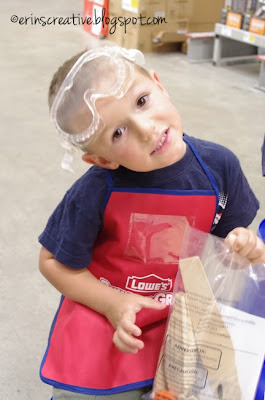 I am in no way affiliated with Lowe's. Just blogging about it. If Lowe's would like to sponsor me, I wouldn't turn them down. 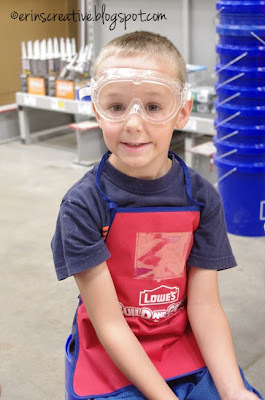 If someone from Lowe's is reading this, you can e-mail me!